Wash and soak all dals for 3 hours. Grind them into fine paste with green chillies, red chillies and curry leaves. Then add all the remaining ingredients except oil for deep frying. Make small vadas of the mixture and flatten it slightly by hands. 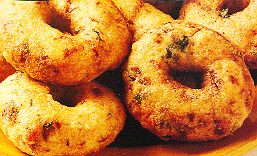 Deep fry the vadais tillgolden brown.